Dorico 2 now includes real-time MIDI recording, an overhauled MIDI transcription engine, new features for media musicians and jazz, and dozens of other improvements across the whole application. 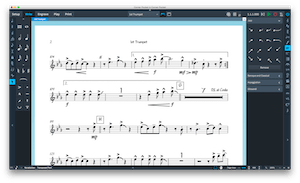 HAMBURG, Germany — Steinberg is pleased to announce the availability of Dorico 2.2, the latest significant update to its next-generation music notation application, introducing a wide range of improvements that make producing beautiful sheet music easier and quicker than ever. Dorico 2.0 introduced a suite of features aimed at helping composers, orchestrators, and copyists working in media music for film, TV, and games, including support for composing to picture, timecode, markers, MIDI controller automation, and more. Dorico 2.2 adds further powerful MIDI-centric features for media musicians, including real-time MIDI recording, improved MIDI transcription, and import and export of tempo tracks from and to MIDI files. Composers can now input music in real time, playing against a click, or import music via MIDI, and experience the improvements in Dorico’s MIDI transcription engine, with advanced automatic tuplet detection, adaptive quantization, and enharmonic spelling. The result is a clean, useful transcription. In the fast-moving world of composing for film, TV and games, being able to respond quickly to edits in the source material is critical. Dorico can now import a tempo track — replacing any existing time signatures, tempos, and markers, but retaining all of the other musical material — from a MIDI file, allowing a cue to be reworked right away. Dorico can also export a tempo track for import into a sequencer if the update needs to be made in the other direction. The 2.2 update has many other new features and capabilities such as enhanced trills, a dialog for editing the appearance of musical symbols, and many workflow improvements for key commands. Dorico 2.0 also broadened the capabilities of the software for musicians working in jazz, rock, pop and other commercial music with best-in-class bar repeats and rhythm slashes, and Dorico 2.2 builds on this with comprehensive support for jazz articulations — scoops, falls, plops, and doits — and sophisticated support for complex repeat structures involving D.C., D.S., Coda, and Fine. Dorico 2.2 is available immediately as a free update for existing Dorico Pro 2 and Dorico Elements 2 users, and new customers buying Dorico for the first time will automatically receive Dorico 2.2 when they install. Dorico is available from local resellers or directly from the Steinberg Online Shop. The suggested retail price is 579 euros including German VAT. Students and teachers can purchase Dorico at the discounted suggested retail price of 349 euros including German VAT. Users of Finale and Sibelius can buy a Dorico crossgrade at the special suggested retail price of 299 euros including German VAT, and a further educational discount is available for students and teachers, allowing them to buy Dorico for just 179 euros including German VAT. • Transfer to and from other programs via MusicXML, MIDI, PDF, etc. This entry was posted in Uncategorized and tagged dorico, dorico pro, dorico pro 2, notazione musicale, software. Bookmark the permalink.